A passer-by who tried to remove a large tree branch hanging from an overhead live power line has been labelled the "luckiest man alive". The man escaped with what he described as "a tingle" on Saturday afternoon before the power was cut from the 11,000-volt line in Mottram, Hyde, in Greater Manchester. Electricity North West has been battling Storm Emma in restoring power to 23,000 homes as wind and fallen trees have damaged overhead lines. The walker rang the operator on Saturday afternoon after touching the branch and was told to move away for his own safety. Chris Fox, incident manager for Electricity North West, said: "This has to be the luckiest man alive. Electricity can travel through things like branches and can kill instantly. It can also jump, so how he avoided death is simply incredible. "He owes his life to a freak combination of circumstances which we still can't quite fathom, including his gloves, his strong walking boots and the fact the branch must have been completely dry. "Even so, we can't believe he escaped unharmed. As soon as he contacted us we cut power to the line, and our specially-trained engineers and linesmen have attended site to remove the branch. 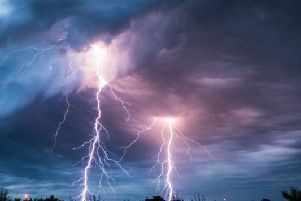 "It is essential for anyone who sees lines down or debris touching lines to stay away and call the emergency power safety number 105 as soon as possible. This will put them straight through to their local network operator who can deal with the situation safely."